For Marion, openness and good humor are at the heart of a successful training atmosphere. For more than two years, Marion has positively impacted the national sales team. As Account Executive and contact for partners and customers in the UK, Heike Zellerhoff enjoys motivating academy participants to reach more success and cares after their individual levels of experience with Shopware. Stefan is a member of the national sales team as an Account Executive. In the Academy, he aspires to convey complex themes with each individual in a highly communicative manner. Michael Telgmann is an old hand in Shopware’s plugin development. He enjoys direct exchange with developers and is always glad to approach detailed questions – the more difficult the better. 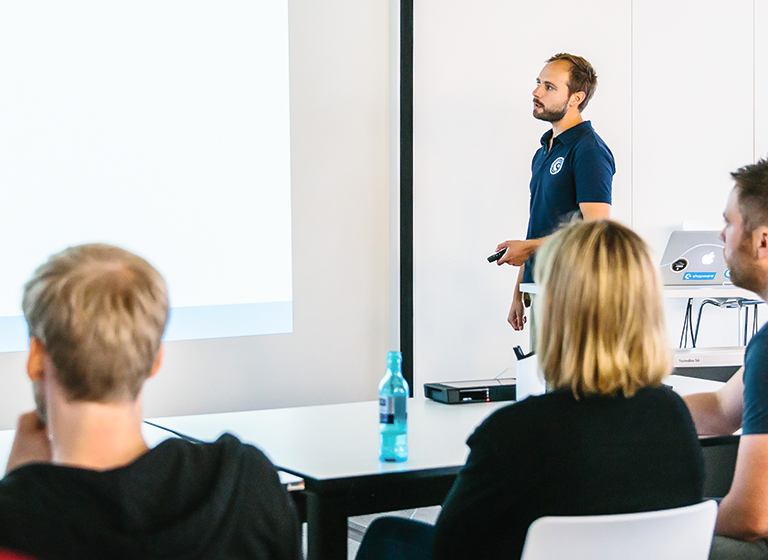 As an expert in plugin development, Jan Bücker is always happy to share his knowledge with participants. In a laidback and relaxed manner, he is always open to interesting discussions. Daniel has profound knowledge of Shopware’s core and plugin development. With an ability to understand complex technologies, he is a vital component of Shopware’s enterprise team, where he connects custom projects with their perfect solutions. With over three years’ experience at Shopware, Philipp is an integral part of the core development team and is primarily responsible for Shopware’s frontend. Also an entertaining speaker, he regularly speaks at trade fairs and the Shopware Community Day. “Too complicated” does not exist with Tobias Berge – in the training, he gladly takes the time to address individual questions and provides thoughtful solutions for individual problems. Active in both development and design at Shopware, Arnold Stoba is eager to share his extensive knowledge in frontend development with academy participants. Holger has been a staple of the core development team since 2016 and is now happy to share his long-time experience with ExtJS and the Symfony framework with the Shopware Academy. Dating back as far as version 2, there has been no other shop system than Shopware for Thomas Eiling. With nearly a decade’s experience working on the agency side of the business, he now enjoys passing along his know-how with academy participants. Niklas is a seasoned PHP developer with a wealth Shopware expertise. As Shopware’s Developer Evangelist, Niklas takes great joy in sharing his collective knowledge and experience with others. With more than five years experience with one of Shopware's first partner agencies, Raphael Emmerich has known Shopware since version 3.0 and, since joining the Shopware team, has become an expert in his own right. Dennis has been a part of the Shopware team since 2014. As an absolute plugin expert, Dennis is responsible for Shopware’s Premium Plugins and coordinating bugfixes, features, refactorings and rewrites. Dennis has a particular affinity for backend modules in ExtJS and eagerly shares his passion with academy participants.